08/11/2011 - In recent years Israel has strengthened its environmental policies and now should develop a green growth plan that combines environmental, economic and social policies. This was the main recommendation of the OECD Environmental Performance Review of Israel. The report is the first OECD review of Israel’s environmental policies since the country joined the OECD one year ago. Presenting the report to Prime Minister Benjamin Netanyahu, OECD Deputy Secretary-General Rintaro Tamaki commended the Israeli government’s recent decision to prepare a green growth plan. As a relatively small, water-scarce, densely populated, and highly-urbanised country, Israel faces pressing environmental challenges. It has made good progress in addressing air pollution, water use and some other environmental challenges. 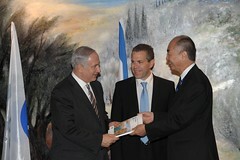 (Left/Right) P.M. Benjamin Netanyahu;Israeli Minister of Environment, Gilad Erdan and OECD Deputy Secretary-General, Rintaro Tamaki. In the process, Israel has developed a dynamic clean-tech sector. However, the fast pace of economic and population growth intensifies pressures on the environment, including waste generation, habitat degradation and greenhouse gas emissions. Continue to expand the use of environmentally related taxes and market-based instruments, and gradually remove tax concessions that are potentially harmful to the environment. Strengthen the mix of policies to support the marketing and diffusion of environment- and climate-related technologies. Reinforce environmental liability for damage to natural resources. Gradually increase the agricultural and industrial sectors’ share in financing the full costs of water infrastructure. Set up a system to monitor greenhouse gas emissions and provide an annual assessment to the Parliament on progress in achieving targets. Review current arrangements to manage waste and draw up a comprehensive new policy, possibly including new legislation and an action plan. email: Ivana.capozza@oecd.org or tel. : +331 4524 1678. For a copy of the report, email: news.contact@oecd.org. For more information on this report see the Highlights. For information on the OECD’s environmental work see: http://www.oecd.org/environment.